Taichieng was established in 1972 firstly as a local retailer for consumption products and we developed to building materials products. 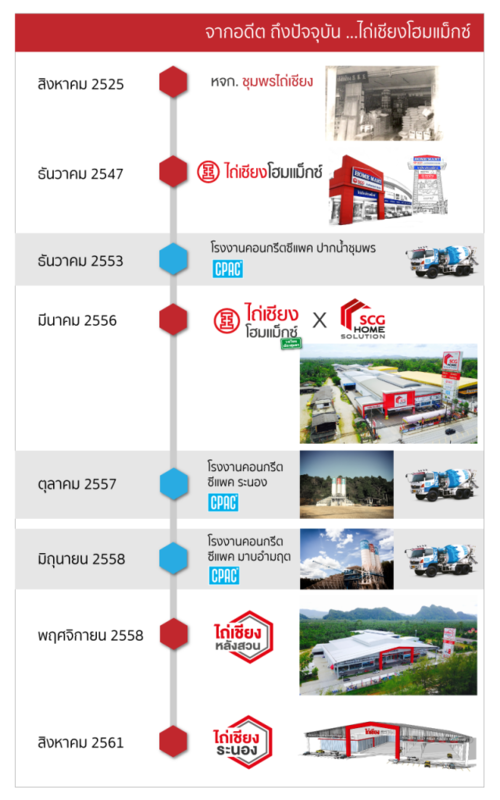 Since 1981, we have been authorised from Siam Cement Group (SCG) to be a dealer in Chumphon Province. Chumphon Taichieng Ltd., Part. was first established in 1981. Taichieng Homemax Co., Ltd. was found in 2004 to distribute hardware goods and building materials construction. Taichieng Homemax has steady growth and expansion by diversifying to specialise in distribution of building materials, tiles, sanitary ware, electric equipment, paint and hardwares. Our company is capable to provide building materials from large project site e.g Condominium, Factory Plant to home improvement customers with quality products and excellent services. We are widely known by dominant contractors and developers in Bangkok. In 2010, We established Chumphon Taichieng Concrete Co.,Ltd. in order to expand ready mix concrete business as CPAC franchise. Our plant located in Chumphon. In 2012, Taichieng Home Furniture Co.,Ltd. has started to provide quality furniture and varieties home decoration products. We are now KONCEPT Furniture authorized dealer. In the same year, Taichieng Homemax also provided a new level of services by integrated with Home Solutions Center, which is SCG distribution campaign, to be able to give advices and consult regards to house building for customers. In 2014, Taichieng Homemax gazes to Ranong Province, where there are an opportunities for business expansion. We setup Taichieng Ranong Trading Co.,Ltd. company to provide wholesale Myanmar border export with partnership. Later, we joint venture with Ranong partners setup concrete plant in Ranong with the name Concrete CPAC Ranong Co., Ltd. Concrete CPAC Ranong is CPAC franchise plant only one in Ranong. In 2015, Taichieng Concrete Co.,Ltd. has set up for operating CPAC franchise plant in Maap Ummarit, where is located in Pathio suburb. Later on this year Taichieng Homemax continues to open the new 8000 sq.m. store in Langsuan, which is potential suburb in Chumphon in the name Taichieng Langsuan Co., Ltd. In 2017, Taichieng Ranong Co., Ltd. was established a new company for retailing and wholesaling in Ranong Province. This store are located opposite Makro and close to Tesco Lotus Ranong Only 2 km from Ranong town center. Taichieng Ranong is under construction and planned to open in Auguest 2018.